The latest volume in The King's Consort's much-acclaimed Vivaldi series brings two further major sacred works, and two smaller ones. Vivaldi wrote his famous setting of Laudate pueri, RV601, for an outstanding young singer, required to possess not only a huge pair of lungs, but also an enormous vocal range, stretching up to top D. Robert King's soloist is one of the fastest ascending stars in the current musical firmament, the virtuosic Carolyn Sampson: her exuberant, clear-voiced rendition is a true delight. French alto Nathalie Stutzmann, much praised for her performances in volume 6 of the series, sings the equally virtuosic introduction to the Gloria Jubilate, o amoeni chori: that setting of the Gloria (RV 588) is not the much-loved (and much-recorded) one, but a colourful setting reckoned by scholars to be an even finer work. 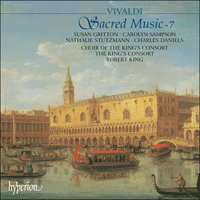 Nathalie Stutzmann also sings the lyrical motet Vestro principi divino (RV 633), and the fine-voiced Choir of The King's Consort complete an outstanding volume with a lively performance of Laetatus sum (RV607).